the ‘pirate’ ship – the buffalo – and the loss of innocence | D.K. 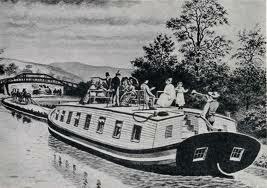 LeVick's "Writing in the Woods"
With the opening of the Erie Canal in 1825 that all changed rapidly on the Niagara Frontier with the advent of the horse-drawn canal boat offering an enjoyable, smooth ride in an eighty foot vessel equipped with a full complement of ceremony to include drinks and bar services. Canadian tourism was growing fast while factories sprouted and lined the banks of the American shore. 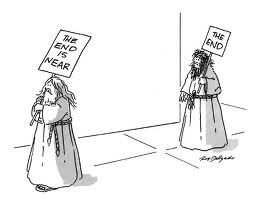 Major turf wars had erupted into violence between developers each claiming the great Falls and surrounding areas as their own! People were beaten and people had died for a piece of nature they didn’t even own. When would people understand that the joy of nature belongs to no man as his own personal pet to be wrapped up, put on display for profit or locked away in a box? No one has a private lock on nature. The gift of creation is given to all. We are visitors only and only for a time. By the mid 1820’s three inns catered to the visitors of Niagara Falls. The owners of these inns were responsible for the first stunt over the Falls in order to attract attention and to boost the tourist trade. 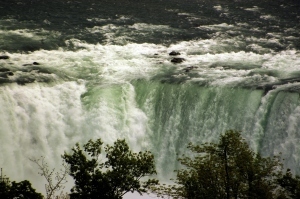 The year was 1827 when three enterprising men, William Forsyth of the Pavilion Hotel, John Brown of the Ontario House and General Parkhurst Whitney of the Eagle Hotel in Niagara Falls, New York, publicized that a “great ship”, would be sent hurtling over the brink of the Horseshoe Falls! 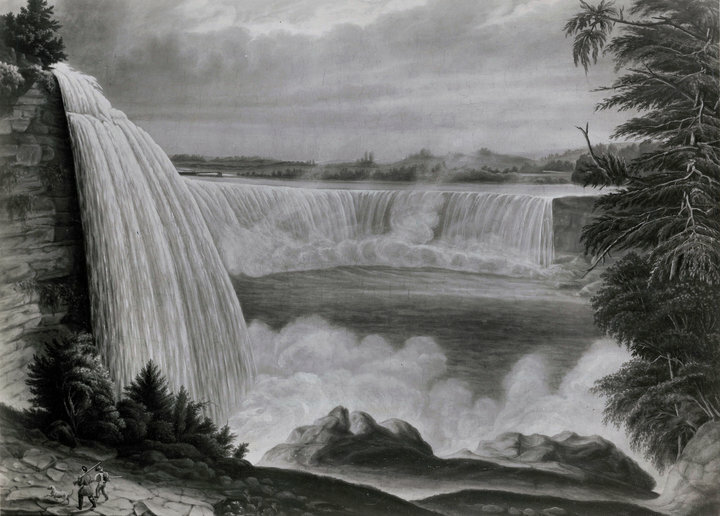 This was when the mighty Falls was at its zenith of power with the water at the crest of the Horseshoe Falls nearly 20 feet in depth! (Today, that same crest of water is only 3 – 5 feet!). 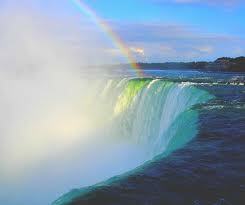 Oh to have lived then and seen the full glory of Niagara! The thunder! The power! Niagara – the magnificent! Forsyth had bought an old condemned lake schooner named “Michigan”, being 16 feet from keel to the deck and displacing 132 tons. 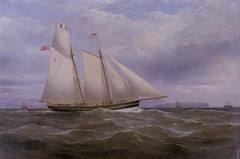 The ‘Michigan’ had successfully braved the storms and fury of the Great Lakes as a merchant vessel plying between Buffalo, Cleveland and Detroit but was no longer capable and was condemned as unfit to sail. They made straw stuffed effigies of pirates, tied them to the side rails and flew the ‘jolly roger’ (and it wasn’t even Halloween yet). Five luxurious steamboats came down the river from Buffalo, bringing the well-to-do to eyewitness the spectacle of sending the unfortunate creatures to their deaths, while sitting in luxury, sipping their cocktails. The ‘public’ houses filled with amusements, drink and games. Men, women, and children gathered around performing pigs, ventriloquists, and various side-show acts. Peddlers hawked their vices and antidotes alike. Men tried their luck at the roulette and dice gaming tables, quickly emptying their pockets while preachers wailed their ‘End of the World’ prophesies. 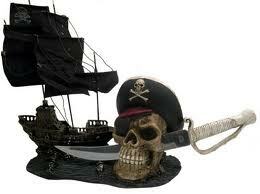 Around 2:30pm, the fierce ‘pirate ship Michigan’ was towed from Black Rock in Buffalo to Navy Island. 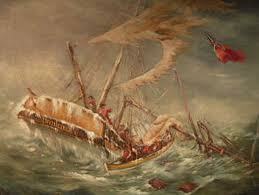 Towing the ship was Captain James Rough, who had been the ‘Michigan’s‘ first captain when she sailed the Great Lakes. Upon reaching Navy Island, the “Michigan” was pointed towards the Falls in mid-river and anchored in place. Prior to its final voyage, celebrities and paying visitors were allowed to board the ‘pirate ship‘ and view the condemned crew. Tension filled the air as thousands flocked the shores of Niagara, climbed the trees, scaled the walls and perched on rooftops to see this “spectacular” event. When the shout “Here she comes!” resounded through the crowd, all fell silent and only the roar and thunder of Niagara could be heard. Reports vary, but contrary to the advertisement of wild beasts from around the globe, most agree that the ferocious crew consisted of two small bears, a fox, fifteen geese (taken from a golf course no doubt), a raccoon, an eagle, a few swans, an old buffalo (is that where Buffalo got its name from?) and a ‘bad’ dog who was sentenced to the ‘Michigan’ for biting a delivery man. At approximately 6 p.m. the fierce ‘Michigan’, again guided by Captain Rough, was towed into the open river 2 miles above the Falls. Captain Rough expertly guided the ‘pirate ship’ (‘”…and who, disguised as schooner Michigan…”) toward the raging, deep rolling rapids where he turned command over to the animals and cut the tow line, bidding his farewell to his old friend (you wonder if a tear ran down his weathered face). As the ‘Michigan’ raced into the rapids, the ship pitched starboard, breaking off her two masts, its hull caught the rocks, ripping its bottom open and the ‘pirate‘ ship began taking on water. Listing thus, the buffalo fell overboard while the two bears eagerly abandoned ship. The other animals and ‘pirates’ didn’t abandon ship but like true sailors ‘went down with the ship’ (they were tied to the ship or locked in cages). Approaching the crest, the decrepit derelict broke apart, shattering in pieces and scattering the unlucky creatures into the maelström of surging waters to meet their fates in the abyss below! One goose survived the plunge and was rescued by Mr. Duggan. It had lost an eye and in short order it was reported to have become the guest of honor at ‘supper’. A bear bested the current and swam to Goat Island. Supposedly, it was captured soon after and became a celebrity put on display in the City of the Falls. Captain Buffalo was not so fortunate and his body was recovered at the bottom of the Falls and after a thorough examination he was pronounced “quite dead”. The “bad” dog lived to bite another day as it managed to swim ashore prior to being swept over the precipice. 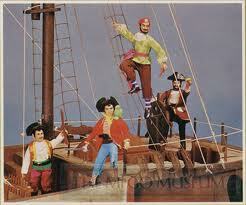 Indeed they ran out of rum and beer before the boat even fell apart. The Romans couldn’t have done better with a coliseum. I’m sure Nero was smiling down from Olympus. One of the spectators in the crowd that day was Sam Patch, who would later become Niagara’s first daredevil diving off of a platform into the maelstrom. The age of the Niagara stuntmen had begun. Niagara had lost its innocence and would never be the same again. great story. enjoyed it a lot. So much wonderful history behind the falls. 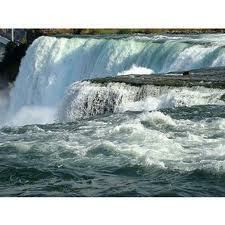 You have given us again a peek into the yesterdays and the stories that surround the the mighty majestic Falls. It must of been something to have been there to see all this. on June 19, 2012 at 9:59 am | Reply The Spirit of Blondin Lives in Wallenda! « D.K. LeVick's "Writing in the Woods"